Children with attention-deficit hyperactivity disorder (ADHD) sleep less, spend less time in the rapid eye movement (REM) stage of sleep, and have a harder time falling asleep than youngsters without attention problems, according to new research published this week journal Sleep. 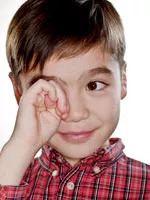 WEDNESDAY, March 4, 2009 (Health.com) — Children with attention-deficit hyperactivity disorder (ADHD) sleep less, spend less time in the rapid eye movement (REM) stage of sleep, and have a harder time falling asleep than youngsters without attention problems, according to new research published this week in the journal Sleep. However, parents should not expect better sleep to be a “miracle cure,” says Dr. Owens. The sleep problems are not considered to be a cause of ADHD, though they may add to a child's attention problems or difficulty with school; about 25% to 50% of children and adolescents with ADHD are thought to have difficulty sleeping. In the new study, Reut Gruber, PhD, of McGill University in Montreal and her colleagues used portable polysomnography machines (which are usually only used in sleep labs) to monitor children at home as they slept in their own beds. They looked at 15 children, 7 to 11 years old, diagnosed with ADHD and 23 children without the disorder, tracking how long it took them to fall asleep, how long they slept, and how much time they spent in each stage of sleep. Parents also filled out questionnaires on whether their child had sleep problems, such as anxiety about falling asleep and daytime sleepiness. None of the children were taking ADHD medication at the time of the study. Overall, the kids with ADHD slept about a half-hour less, on average, and spent 15 fewer minutes in REM sleep. The control group spent about 19% of their sleep time in the REM stage, compared to about 17% for the ADHD group. The children with ADHD also took longer to fall asleep, were more anxious about sleep, and less likely to get enough sleep. The researchers plan to look at other factors, such as circadian rhythm or changes in brain chemicals like dopamine and norepinephrine (which are known to play a role in sleep, attention, and arousal) that may link ADHD and sleep. Other possibilities include adjusting a child’s medication to avoid an out-of-control period before bedtime, using relaxation techniques to help a child with bedtime-related anxiety prepare for sleep, or even giving a child light therapy to reset his or her circadian clock, says Dr. Gruber. Many researchers now believe that children with ADHD may have a “phase shift” that makes them feel ready to go to bed later at night than their peers, which makes it even more difficult to get up in the morning. To find a doctor with the training to address sleep issues in children, Dr. Gruber recommends contacting the American Academy of Sleep Medicine, which offers a list of accredited sleep centers by location and certifies physicians in sleep medicine. While the jury’s still out on whether improvements in sleep will translate to increased focus during the day, it will likely result in fewer signs of sleep deprivation—which can look a lot like ADHD. The Canadian Institutes of Health Research and the Fonds De La Recherche en Sante funded the study. Quiz: Could You Have Adult ADHD? What If My Child Shows Signs of ADHD?